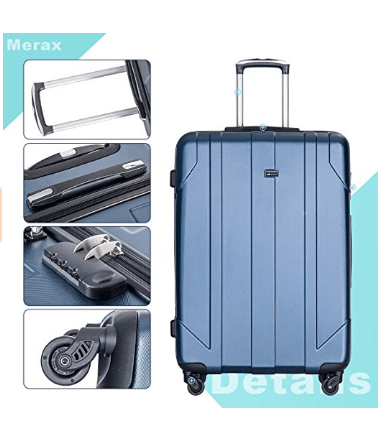 Merax P.E.T Luggage Set is made up of three sizes of lightweight and ecologically friendly hardshell suitcases with spinner wheels and innovative design. This is a competitively priced luggage set with six color options of black, blue, gray, purple, silver and red. PET is a new eco-friendly, tasteless and non-toxic relatively low-cost material for suitcases and even holds FDA’s food grade certification for green materials. Despite not being heavy, it is resistant to impact and stress, low and high temperatures. The resistance and durability are actually tested before getting out in the market. The test involves a 2-ton cargo truck rolling over and PET material survives without any damage and gets back to its original state pretty quickly. Then you have the test of 20 x single wheel drop, 1000 x 50 lb. handle and 20 mile 50lbs rolling. You can use the suitcases for many years to come, also thanks to the anti-aging and anti-UV features. 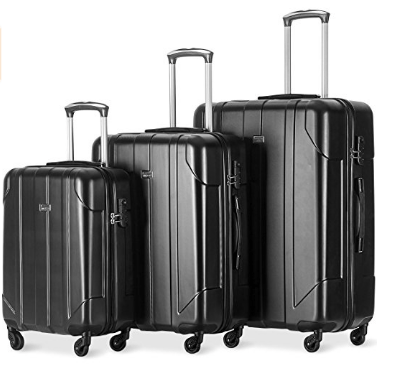 The luggage set is offered with a 5-year warranty globally. Just like with the other luggage sets, you will get the small one fitted into the medium one and the medium into the large 28-inch suitcase. This is both convenient and will save you on storage space. These three Merax P.E.T suitcases are not sold separately and you can only get them as a set of three. As you know, a lot of the hard shell suitcases are made of ABS, PC or PP materials and the manufacturer claims that the PET material is superior in terms of durability and how it can resist better to lower temperatures. This will not fade in the sun, not age quickly and not scratch or break when thrown around by airport staff. These are designed to resist temperatures as high as 158 degrees Fahrenheit and as low as -4 degrees. The smallest cabin luggage weighs roughly 6 pounds and measures 21 x 13 x 9 inches including the wheels. The medium size 24-inch weighs 8 pounds and measures 25 x 16 x 10 inches and the largest 28″ weighs 10 pounds with the dimensions of 29 x 19 x 11 inches. They have the three digit locks that were set to 0-0-0 to begin with and you can reset them. The multidirectional spinner wheels are easily maneuverable and roll smoothly 360-degrees in all directions. These suitcases are not really expandable but offer you plenty of space. The largest suitcase has a 55 pounds capacity, the medium has 44 pounds and the 20″ carry-on bag has a 33 lb. capacity. Each suitcase has a handle on the top, a side handle and the retractable metal handle. Definitely great value for money!